Hello there! If you’re here it’s probably because you are interested in being apart of the Crossline Church staff on the Crux Student Ministries team this summer! 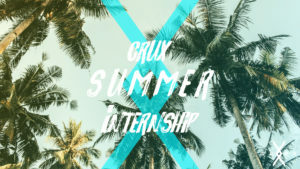 Below you’ll find a helpful overview of what it looks like to be a summer intern with us at Crux as well as how to apply. We want our summer interns to get an immersive Youth Ministry experience. As a part of our staff this summer you would get a glimpse into all things Students Ministries here at Crux including (but definitely not limited to) office work days, planning and attending our events, writing a devo/lesson, MCing, and leading with us at Hume Lake. Our heart for this internship is that our interns would get as much training and teaching as possible, in addition to, as much hands on experience as we can pack in. This summer internship will be challenging, stretching, and incredibly fun! This internship is paid, and details of the financials will be discussed upon applying. The time commitment is roughly 20 hours a week, which includes office hours and events. In order to apply for the Crux summer internship you will need to complete and return the internship application by Tuesday, May 8th. You can return the application to our offices at 23331 Moulton Parkway Laguna Hills, CA, fax it to (949) 916-0255, or scan it & send it to the email provided below. After the application is completed we will schedule two interviews (one with our Crux staff and one with our Senior Pastor). Finally, our intern program will run from early June to mid August.